Mix these together well, using a sieve if need be to squish the lumps in the baking powder. It works fine to use a kitchen stand-mixer with dough hooks. a ¾ cup measure with one egg and the rest made up of a milk product. Buttermilk is my favourite for this part. Give it a try - very easy and an important added touch when serving a homemade soup, stew, or chowder. Look's delicious. I'm thinking about giving the recipe a whirl.....that they arent that great the next day gives me pause. I can eat, but no that much do you think the recipe can survive being halved? Jeez Chris, next you'll be posting recipes for grits. fallingwickets wrote: Look's delicious. I'm thinking about giving the recipe a whirl.....that they arent that great the next day gives me pause. I can eat, but no that much do you think the recipe can survive being halved? Better to make the same amount, and freeze half the dough. Clive, you could always make 1/2 the recipe with a larger diameter and making breakfast biscuits with a round of sausage, a slice of cheese, and on the day of consumption a fried egg. I don't use Chris' recipe, but I'll make biscuits specifically for breakfast. I freeze them ready made and just waiting for the microwave warmup and the egg. Nice looking biscuits Chris. Have you ever made Bakewell Cream biscuits? I don't know if that leavener gets up to you, but it might. ShadowsDad wrote: Clive, you could always make 1/2 the recipe with a larger diameter and making breakfast biscuits with a round of sausage, a slice of cheese, and on the day of consumption a fried egg. I don't use Chris' recipe, but I'll make biscuits specifically for breakfast. I freeze them ready made and just waiting for the microwave warmup and the egg. You've lost me there. I have heard of Bakewell tarts, and cream of tartar, but not Bakewell cream. Is it some form of pre-mix? Biscuits, like the diagnosis of appendicitis, can be the easiest and also the hardest. Mine come out a little crunchy on the outside but wonderful if eaten fresh. Back when the hospital kitchen cooked from scratch I learned that biscuits could be soft and chewy and would keep at least a day. There again, my mother's scones (biscuits are something else entirely to a Brit) were crumbly and bread-like. While the ingredients were the same except for the raisins she added, you wouldn't think they were related in any way. I would be interested to learn how to cook the chewy soft biscuits. Bakewell Cream is a type of leavener that was developed due to the shortages during WW2. It works very nicely and lends a unique character to biscuits. I know that it's a Maine thing but I didn't know if it was as far north as you're locale. It can be found online, but we buy it at the supermarket. I suspect that the "extra lift" given by the Bakewell Cream is due to the complete lack of expiration date for the leavener. I change my Rumford baking powder every 6 months or so to make sure that it's fresh and working. Mainers are pretty frugal and I suspect hold onto their baking powder for longer than they should. BTW, the gent who wrote the story above didn't find a different taste, but I do. The color of the baked goods is IMO quite noticeable. These recipes should give you what you want. 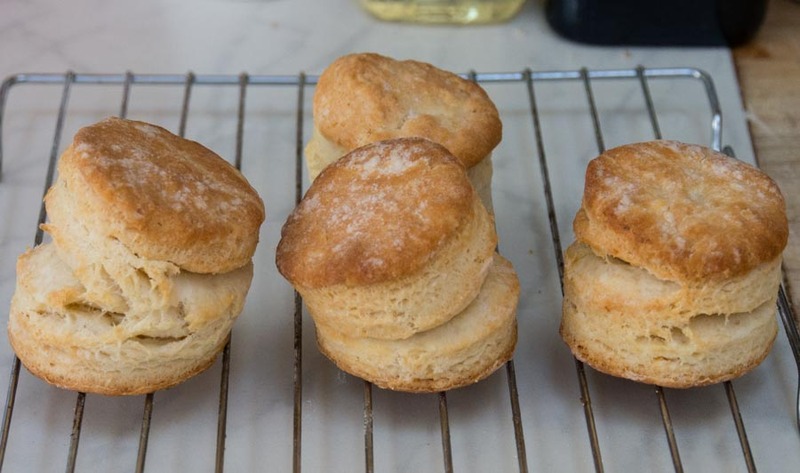 Two recipes, one for a dropped biscuit and one for a cut Bakewell cream biscuit. There is a 3rd recipe that I use that I didn't supply. If you can get Rumford baking powder, I use the recipe on the container. All of these recipes use general purpose flour. Gluten development isn't what's desired in a biscuit, so no bread flour and no long mixing after the liquid is added. If you need the Rumford recipe let me know. These are just as the name suggests, the best dropped biscuits. Easy too! BTW, the recipe says to allow the melted butter to cool 5 minutes before mixing. I let it cool for much longer the first time, it still worked. Yield is approx. 10-12 biscuits. 8 TBL unsalted butter, melted and allowed to cool for at least 5 minutes, or at room temperature. Adjust oven rack to the middle position and heat oven to 475 degrees F.
Whisk together the first 5 ingredients in a large bowl. Combine buttermilk and melted butter in a medium bowl, stirring until butter forms small clumps. This happens very quickly if everything is at the right temperature. It’ll be a clotty mess, but that is exactly what is desired. Add the buttermilk/butter mixture to the dry ingredients stirring with a rubber spatula until just incorporated and mixture pulls away from the sides of the bowl. Using a greased 1/4 cup measure scoop level scoops of batter and transfer to a parchment lined rimmed baking sheet (biscuits should measure approx. 2 1/4 inches diameter by 1 1/4 inches high). Repeat to use up the batter, spacing biscuits approx 1 ½ “ apart. Bake until tops are golden brown and crisp 12-14 minutes. Brush biscuit tops with the remaining butter, transfer to wire rack and allow to cool 5 minutes before serving. Clabbered milk: Take 1 cup of milk and 1 TBL of lemon juice, mix and let stand for 10 minutes. Add ½ cup (2 ozs) shredded Cheddar cheese and 1/4 cup thinly sliced scallions to the flour mix. Add 3/4 cup (1 ½ ozs) grated parmesan cheese and ½ tsp finely minced Rosemary leaves to the flour mixture. Cooks Illustrated, Nov/Dec 2007 pages 18-19. Directions for mixing by hand are on the Bakewell Cream can. Put the first set of ingredients in the plastic bowl with the single wire whips. Set the mixer to lowest speed and allow the fat to cut into the flour. While this is happening get the second and 3rd sets of ingredients together. After the flour/fat mixture looks like sand with an occasional piece of gravel, sprinkle the 2nd set of ingredients (with a spoon or my hand) into the mixture and around the bowl as it’s mixing. Allow to mix for a few seconds to incorporate. Then add the milk, again, around the entire bowl. This will incorporate in mere seconds. Turn out onto a floured countertop and fold as required to make sure the dough comes together. Pat out, or use a roller to get the dough to 3/4" thick, cut into the required sizes/shapes. Put on greased sheet pan and bake for 5 minutes @ 475. Then turn the oven off and leave the biscuits in for another 5 - 10 minutes. I get it, acid sodium pyrophosphate instead of tartaric acid to make the bicarb produce CO2. I wonder where the cream of tartar that was in short supply in WW2 came from? That I can't tell you. Interesting question though and you got my interest up. The Bakewell Cream has another advantage. It has no shelf life as other chemical leaveners have. That may be where it got it's reputation for being a sort of super leavener from. I just find that I prefer the taste and the tannish color of the biscuits it makes. The first time I tested them I knew they were different and I had to ask the cook what it was that made them different. Researching the other baking powders and WW2 shortages.